Michael Hite, marketing director of the Creative Foundations, takes a selfie with the agency's clients who painted the panels for the Boardman Arts Park. From left to right, Madge George, Bryan Burks, Danielle Gould, Jessica Hodge, Anna Davis, Amanda Brodess, Jennifer Curtis and Tricia Kiam posed for photos next to their artwork. The Boardman Arts Park is a project of the Northwest Neighborhood Association. Delaware City Schools and the City of Delaware approved the NNA to convert a portion of the Boardman Field to become an outdoor gallery for two years. Allison Finch, Creative Foundations' art coordinator, takes a photo of James Jeffire, left, Brandon Leeper, Corey Hinton, while Joey Arcuri watches. This is the Creative Foundations' installation team of initial artwork for the Boardman Arts Park at the Delaware City Schools-owned field along Williams and Catherine streets. The Northwest Neighborhood Association received approval to use more than a quarter of the Boardman Field to become an art park. Roxanne Amidon, right, president of the Northwest Neighborhood Association, talks with Jeremy Fetty of Creative Foundations. 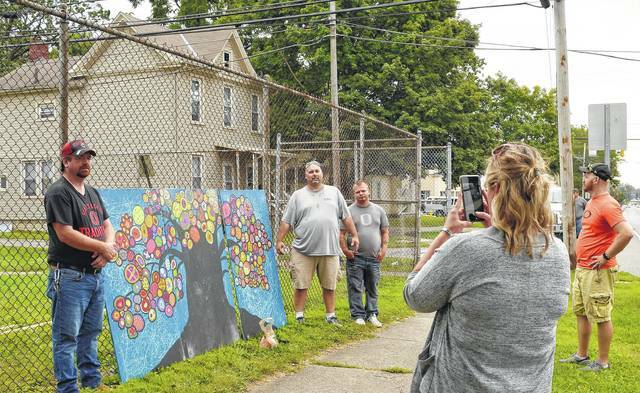 Fetty was a co-leader with Joey Arcuri, far left, to install artwork from their agency at the Boardman Field as part of the Boardman Arts Park. Arcuri receives instructions from Brandon Leeper, who uses sign language. The Northwest Neighborhood Association and Creative Foundations have painted the first strokes to create an art park near downtown Delaware. 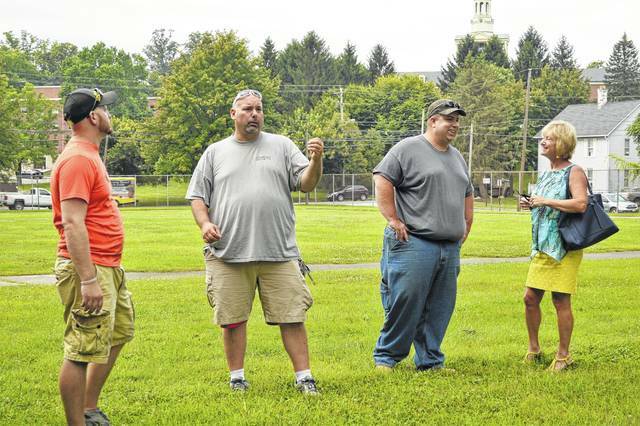 The organization is converting more than a quarter of the 2.2-acre green space along Williams, Catherine and Winter streets, known as the Boardman Field, into a demonstration space, said Roxanne Amidon, president of the NNA. The outdoor gallery will be called the Boardman Arts Park and will provide an opportunity for the community to contribute artwork and a place to host events such as concerts, galas and fundraising activities. “We want to bring people together,” Amidon said. Delaware-based Creative Foundations staff donated and installed Friday morning the first art panels along the fence of the field. There were initial plans to have the Arts Castle contribute the work, but agreements could not be finalized, Amidon said. 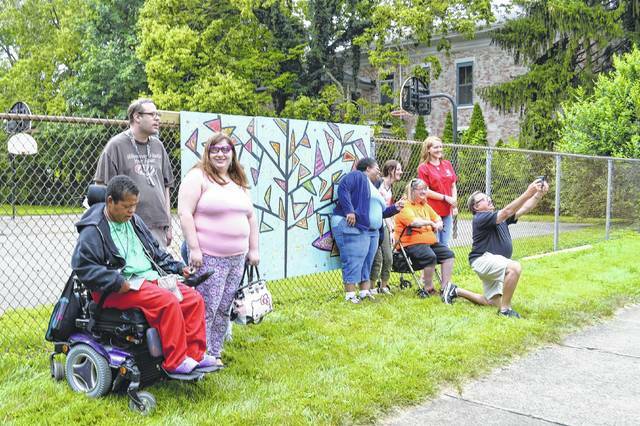 Instead, some of the Creative Foundations clientele, who are individuals with developmental disabilities, painted the panels donated by Joe Diamond, the property owner of 57 N. Sandusky St., where the agency is located. The artists visited the field to see the installation of their work. “What we like is to have them out in the community,” said Michael Hite, marketing director for Creative Foundations. Allison Finch, the agency’s art coordinator, said the group chose trees as the theme for the panels and worked on the project for about two weeks. The panels coincide with the art park’s logo, which is a tree of stars supported by hands. “We didn’t even plan that,” Amidon said. The Boardman Field was the location of the second West School, built in 1905. Its name changed to Ruth Boardman Elementary School in honor of a longtime principal. Boardman’s sister was also a teacher at the school. Between them they taught for more than 100 years. The building was demolished in 1979 to become the athletic field for the Willis Intermediate School as part Delaware City Schools. The school transitioned to become the Willis Education Center, 74 W. William St., housing administrative offices and no longer receives students. Therefore, it no longer needs the site as much for recreational space. The NNA envisioned the field’s next evolution as a passive park. Planning started early last year. The school district and Delaware City Council granted permission to the NNA to have a demonstration space for the next two years. The field will still have space for Ohio Wesleyan University groups, the district’s lacrosse team, and its field days for fifth graders, said Delaware City Schools Superintendent Paul Craft. The district will evaluate those uses before making any infrastructure changes in the next few years. The NNA has raised $1,000 as seed money to cover the insurance, signage, and additional materials for the park. The nonprofit neighborhood group will reach out to merchants for donations or to become sponsors of the art park. Also, it may have a sponsor to build an amphitheater in the future, Amidon said. The field’s volleyball and basketball poles will be incorporated into the park, Amidon said. She expects the park to take shape by the end of September. The Boardman Arts Park’s Art Selection Committee is spearheading efforts to secure more exhibits. Members of the committee are Chairwoman Pat Holstein, Aaron Cook of Delaware City Schools, City of Delaware Parks and Natural Resources Director Ted Miller, OWU fine arts professor Jon Quick, and Jessi Walker, the former director of what is now Gallery 22. Michael Hite, marketing director of the Creative Foundations, takes a selfie with the agency’s clients who painted the panels for the Boardman Arts Park. From left to right, Madge George, Bryan Burks, Danielle Gould, Jessica Hodge, Anna Davis, Amanda Brodess, Jennifer Curtis and Tricia Kiam posed for photos next to their artwork. The Boardman Arts Park is a project of the Northwest Neighborhood Association. Delaware City Schools and the City of Delaware approved the NNA to convert a portion of the Boardman Field to become an outdoor gallery for two years. Allison Finch, Creative Foundations’ art coordinator, takes a photo of James Jeffire, left, Brandon Leeper, Corey Hinton, while Joey Arcuri watches. This is the Creative Foundations’ installation team of initial artwork for the Boardman Arts Park at the Delaware City Schools-owned field along Williams and Catherine streets. The Northwest Neighborhood Association received approval to use more than a quarter of the Boardman Field to become an art park.